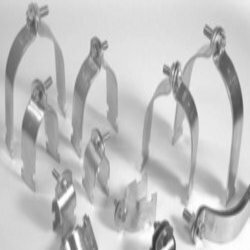 With the assistance of our dedicated team of professionals, we are providing a premium quality range of Pipe Clamps With Rubber Clips. With the use of high graded raw materials we are offering one of the finest Steel Pipe Clamps with Rubber which are highly durable and ready to give an ultimate customer satisfaction. These products are designed by the most expert designers which has made this product more resourceful to the clients. We are looking queries from Foreign Countries only. Supported by a team of well qualified and experienced professionals, we are engaged in offering a wide array of Split Pipe Clamp With Rubber to our respected customers.All the products are variable according to sizes and quality.Minimum 500 pieces can be delivered. We are a highly acknowledged organization, engaged in presenting a remarkable range of Rubber Pipe Clamp. 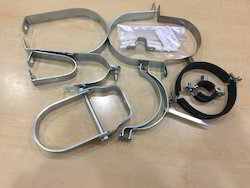 We offer single pipe clamp with rubber lining nad non rubber lining. Material: Carbon Steel / Hot Rolled Steel/Cold Rolled Steel Finish: Pre - Galvanized / Electroplated Applications : Designed for the suspension of cast iron, PVC and GI pipes. Frequently specified for supporting sanitation, water supply, fire fighting, HVAC and electrical pipes. - Advantage: Easy to fix pipes with anchor. - Available Size: 1", 1 1/4", 1 1/2", 2", 2 1/2", 3", 4", 6", 8"
Owing to the wide experience in this domain, we are instrumental in offering Pipe Clamps With Rubber to our clients. Owing to the wide experience in this domain, we are instrumental in offering 12 Inch Pipe Clamp to our clients. We are one of the most well-distinguished companies in the market that are into offering Pipe Rubber Clamp.